Bacon and asparagus come together in perfect harmony with these little bundles of pure, keto-friendly joy. They can be made ahead of time for a meal prep, stored in the fridge, and then baked fresh in the oven anytime you are ready for your meal. This versatile dish makes for a wonderful appetizer and can also be paired with a delicious breakfast casserole or even served alongside pancakes. Bacon can almost instantly turn anything from good to great and asparagus is no exception. Asparagus is a great low carb veggie option to include in your ketogenic diet due to its great health benefits. Asparagus is rich in vitamins A, C, E, and K, and trace minerals. Another reason why asparagus is a wonderful vegetable option for keto is that it is low in carbs and a good source of fiber. This fiber can help improve digestion, move food through the gut, improve liver function, and cleanse the body of toxins. This is key in reducing the risk of heart disease, stroke, diabetes, and gastrointestinal diseases. This vegetable contains glutathione which acts as a major antioxidant. It’s a detoxifying compound that helps break down free radicals and carcinogens which can protect against certain forms of cancer and heart disease. In addition, these antioxidants can help slow the aging process and can also help reduce inflammation in the body. Asparagus naturally contains an amino acid called asparagine which increases urination production. Releasing excess fluids in the body is especially beneficial for those suffering from high blood pressure and heart-related medical conditions. Keto-favorite bacon, and nutrient-rich asparagus are a match made in heaven that will have you and your guests coming back for more. 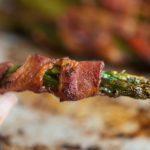 A delicious starter course for any special gathering, these crispy keto bacon wrapped asparagus bundles are great for dinner parties or easy weeknight meals. Wrap 3 asparagus spears with a single slice of bacon in one even spiral layer. Place on prepared baking sheet. Repeat with remaining ingredients. Drizzle with olive oil and sprinkle on salt and pepper to taste. Bake for 20-25 minutes until desired crispiness of bacon is achieved. How many servings is this considered? Hi Amy, this recipe yields 12 bundles cooked. Hi, this recipe yields 12 bundles. Okay so much does one person eat? Hi Sharon, it depends on your dietary needs and goals. But this recipe yields 12 bundles and has 46 calories per bundle.